Let's establish this from the outset, all revolutions, including the one in Egypt are messy affairs. Establishing representative democracy after decades of authoritarian rule and/or monarchy, as history has shown, doesn't happen without much trial and tribulation. Just look at our own American revolution. It was fraught with mistakes and certainly wasn't favored by most of the people. The leadership was dominated by white, male landed gentry and included no women in directly establishing the government. Slavery was a divisive issue and essentially avoided. But the American Revolution is not the focus of this piece. That focus is on Egypt and what has transpired not just in the last few days but goes all the way back to the initial Arab Spring that began in 2010 after a fruit seller in Tunisia self immolated himself protesting against the oppression of his government which became the catalyst setting off the Arab Spring not only in his country but much of the Arab world, including of course Egypt. The intent here is not to describe a thorough history of what has transpired since Hosni Mubarak's overthrow in February 2011, but highlight some of the conditions and major roadblocks newly elected President Mohamed Morsi faced upon taking office in August 2012. Remember, the newly elected people's assembly (parliament) was shut down weeks after it first met by the country's Supreme Court saying it was not representative of the majority of the Egyptian people and dominated by members of the Muslim Brotherhood (of which Morsi had been a member). The Court members were all holdover appointees of the former Mubarak regime, (and a major stumbling block imposed on the new president). 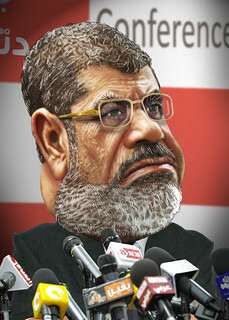 So with the popularly elected assembly closed down by the Court, no constitution written and approved defining the separation of powers of the president and the legislature and a holdover Supreme Court of the Mubarak regime ready and willing to oversee and reject most anything the new president wanted to initiate, Morsi had to decide how to proceed as the newly elected president of Egypt.